100% Complete and delicious wet dog food for adult dogs. Served on its own or on top of dry dog food, it makes for enjoyable healthy meals. Nutrition for dogs that helps support healthy bones, good digestion, a healthy skin & coat and a strong natural defences. Dog food developed with our vets and nutritionists at Waltham Pet Nutrition Centre. 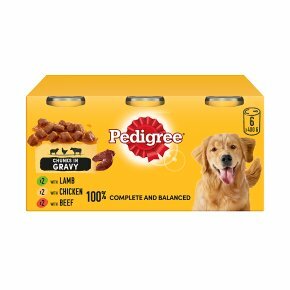 This pet food contains no artificial colours, flavours or preservatives.100% complete and balanced, Pedigree tins are not only nutritious wet dog food but also make for highly enjoyable everyday meals that will bring out their infectious enthusiasm. Developed with the help of vets and nutritionists at Waltham Pet Nutrition Centre, Pedigree dog food has all the essential nutrients to support optimal digestion, a healthy skin and coat, strong natural defences and healthy bones. Pedigree tinned dog food contains no artificial colorants, flavours or preservatives.